Easy Security is a complete security solution that can help you setup and maintain security in Microsoft Dynamics NAV - saving you time, money and resources. Easy security is certified for Microsoft Dynamics NAV and is available for all versions of NAV from Navision 2.6 and later. Easy Security consists of only new objects and therefore requires no merging. This combined with the installation wizard, which guides you through the setup, allows for an easy and quick installation. Easy Security Logins and Permissions can be installed and set up in less than 15 min. Easy Security Light is a free version of Easy Security with limited functionality. With Easy Security Light you can record permissions for TableData. Easy Security Light is wizard driven which makes for fast and simple creation of new permission sets and permission set assignment. Snapshots provides an easy way to get an overview of security setup in your database and makes it possible to revert a user’s permissions or permissions in a permission set back to an earlier setup. "The time to set up a role manually could take up to 2 hours, but with Easy Security, it takes 5 minutes, and 90-95% of the tasks were accurate after only one recording." “Mergetool.com has done a great job developing an application that stands on its own and doesn’t interfere with other NAV functionality—I love that kind of programming elegance." Was very pleased with the SQL Profiler, with the ability to record all database transactions, the SQL profiler integration makes it possible to record roles directly using the RoleTailored Client and web services integrations like the NaviTrans Graphical Planboard. Because Cacique is using the RoleTailored Client version of NAV, Eddie used the SQL Profiler to record tasks as the user executed them. These tasks included login and logout and any data permissions accessed during the task, including forms, pages, codeunits, and reports. Modules and pricing for Easy Security. 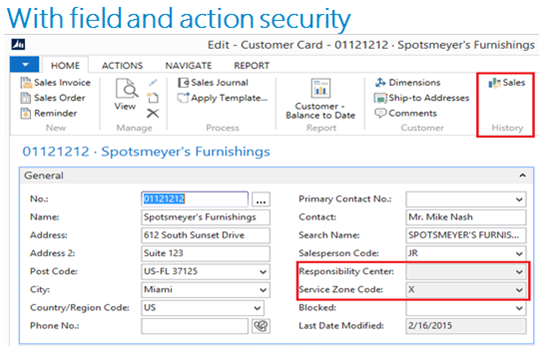 The Easy Security must be purchased through your NAV partner as other modules for Microsoft Dynamics NAV.